Giving something back better than you received it! One of my grandsons was receiving tutoring over the summer, and the teacher sent a deck of vocab game cards home with us for further practice. She asked us to return them when school started, so I thought it would be nice to dress them up a little and add a few tokens of appreciation. I have been wanting to make the backpack from SVG Cuts Back to the Books kit, so I thought this would be a great way to tackle two issues. 1. Returning the cards in better condition than we received them, and 2. Making the backpack. 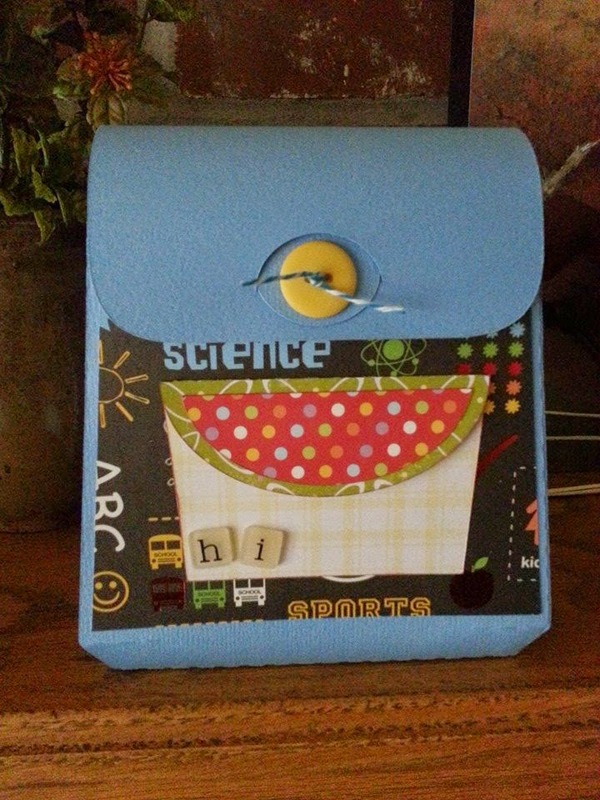 I put the cards and a couple of note pads, and sticker sheets into this little darling and sent it off with my grandson this morning. I'm sure she loved it! I used 2 12x12 sheets of AC solid color card stock for the back pack. One sheet of DCWV premium stack called The Grade School stack. The pocket on front was made from scraps. The dot sheet from the Grade School stack, and the main pocket piece was from Making Memories Dilly Dally collection. The button and letters are from Doodlebug Designs and the twine was from the bargain bin at Michael s. I did ink the edges of the pocket and the panel. I think I got is cut and assembled in about an hour. Super easy. Super cute! Thank you for stopping by. Please visit my Facebook page and give me a like! All projects are cut using the Sizzix eclips version 1. Paper projects are fun to make, but paper can be expensive. I have found some ways to make my paper pads go a little farther so I make sure to get my money's worth. It helps me afford the svg kits I love to buy from SVG Cuts. I would like to share some of my tips with you, so that you too can enjoy more crafting on a budget. Today I'm sharing my love for The Dollar Tree! I have found so many things at the Dollar Tree that I can use in my crafting. And for $1 it is usually a savings over the craft stores or even Wal-Mart. I did some shopping there this week for the first day of school teacher gifts I'm sending with the boys. I bought some little note pads, pens and sticky notes. With these few items, I'll fill up a desk set and it will be adorable, useful and cheap! And each purchase will make more than one gift. 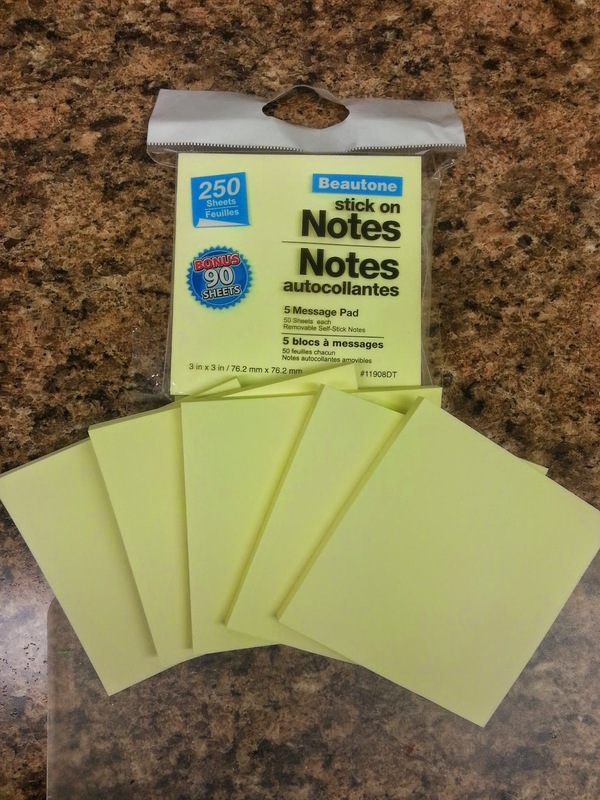 In the front is a pad of sticky notes. I get one package of 5 and split them out. The pens came 3 to a package. Next are the cards that I made. Behind the cards and their envelopes are two little lined note pads. There are 5 pads in one package. 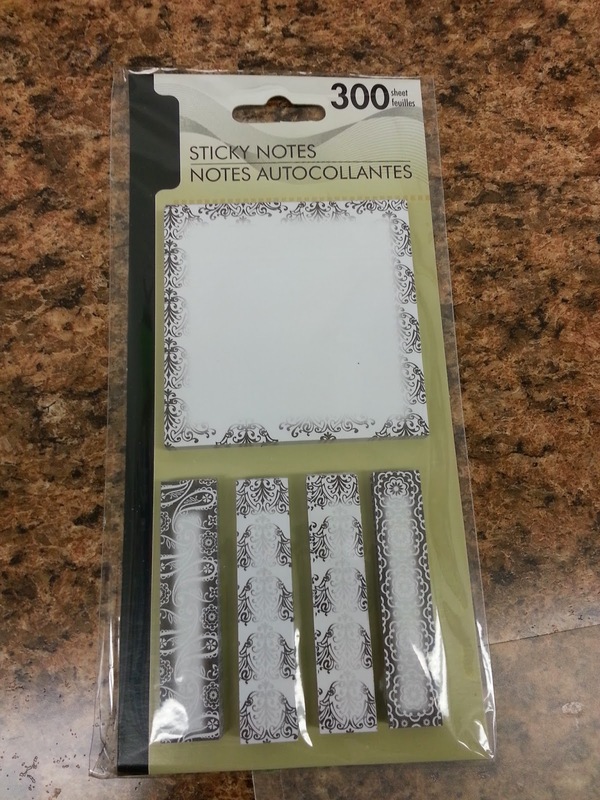 The last item is a really nice set of sticky notes that have standard size notes and little "flag" type notes. I left them intact since they were just a $1! To keep from using two pieces of the decorative card stock on the desk set, I cut the bottom piece from the same card stock as the green piece on top. I was able to use the entire 12x12 sheet. 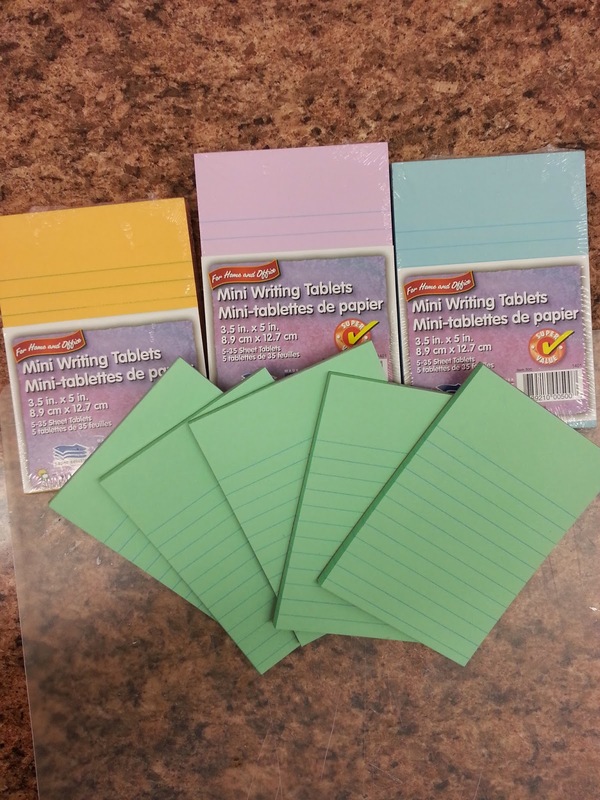 So, for these two sets, instead of using 5-6 sheets of card stock, I only used 3 sheets. The apple is one, the one with the writing is two and the green for the border piece and bottom was three! Even on the cards, I changed the size a little so I could cut two card bases from one piece of 8 1/2 x 11 card stock, instead of a 12x12. I also save by using the thinner paper from the large paper pads for decorative panels. 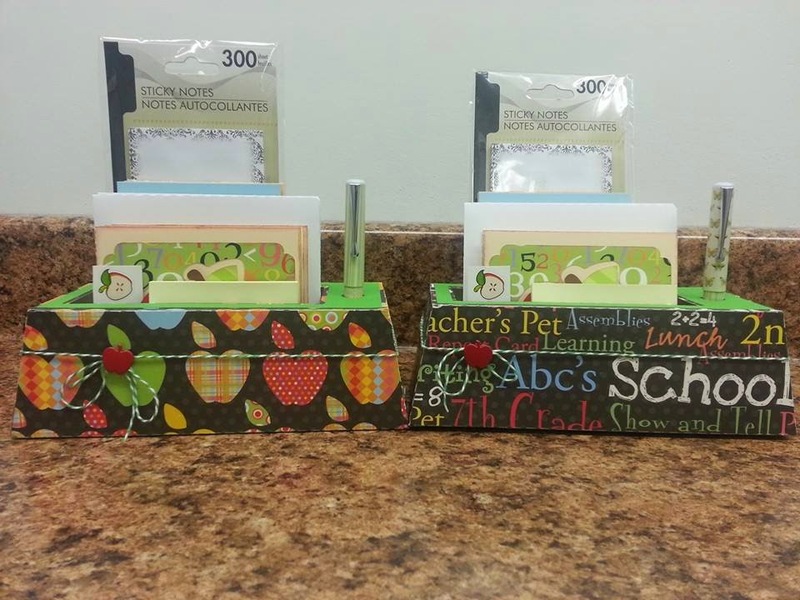 This is just one example of ways you can save on supplies and add-ons to keep gift items within budget. I'll share more money saving tips in the future and would love to hear how you save too! Be sure to visit my Facebook page and give me a like! Thanks for stopping by!